Derby County fans. Image by Jez Tighe. A draw at Middlesbrough and a heroic failure to advance in the Carabao Cup are what manager Frank Lampard has to reflect on this week. Saturday’s game at The Riverside was quite bizarre! Two own goals for either side and Middlesbrough despite being outplayed for long periods and failing to have a single shot on target salvaged a point due to the misfortune suffered by Jayden Bogle who put the ball into his own net. This cancelled out an earlier own goal by Friend. It is encouraging though to pick up seven points from our last three games, but we have an awkward looking home match on Saturday against Garry Monk’s Birmingham City who are in a rich vein of form at present. It will be interesting to see how Derby respond after being edged out midweek in the cup tie at Chelsea. Losing 3-2, but again the defence was credited with own goals. This time Fikayo Tomori (Playing against his parent club) and Richard Keogh were the unlucky recipients of the unwanted statistic. To be fair the team put in a good shift and two great goals were recorded! A great finish by Jack Marriott and Martyin Waghorn getting on the end of a Mason Mount cross kept us in the game. Hopefully the team won’t be too tired after Lampard named an unchanged side at Stamford Bridge. Last time out after our cup success at Manchester United, we flattered to deceive at Bolton. Birmingham City have had a good start to the season and are on a run of eleven games unbeaten. Lucasz Jutkiewicz is the form player of the moment with eight goals scored so far! We don’t need any reminders of how dangerous he can be at Derby. Last season he came of the bench for the Blues and scored with his first touch. Sam Winnall did similar for us. What will be interesting is the crowd size. I expect that Birmingham will sell their full allocation so we ask the question, will Rams fans turn up in their numbers or will people continue to stay away. The style of football we are playing at the moment should be attracting 30,000 crowds yet the numbers still trail our neighbours across Brian Clough Way. That was unheard of in recent years until this season. 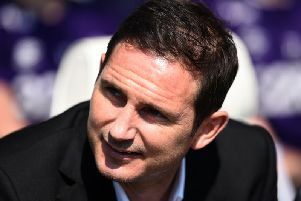 I expect Frank Lampard will probably stick to the same side and the good thing about that is he has managed to fit Mount, Wilson, Marriott, Waghorn and Lawrence all into the same side without losing the effectiveness of any of them! Tom Huddlestone has impressed in the holding role of late and that has meant Bradley Johnson having to be satisfied with a place on the bench. On Wednesday night Florian Jozefzoon couldn’t even get a place on the bench. Andre Wisdom has been missing from the match day eighteen for a few weeks too! The competition for places is healthy and at the moment is certainly and advantage!